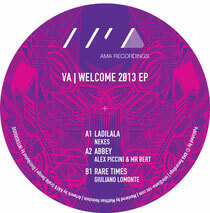 Ama Recordings kicks off 2013 with a various artists release entitled ‘Welcome 2013’, featuring tracks from Nekes, Alex Piccini & Mr. Bert, Giuliano Lomonte and Bolumar. Ama Recordings had a decent 2012, welcoming the likes of Mobius Stum, Little Fritter, Chris Carrier and M.in to the roster. Here the label kick starts a fresh year with a four track release, introducing Alex Piccini & Mr. Bert, Giuliano Lomonte and Bolumar to the imprint and label-head Ray Okpara, again enlists the services of producer Nekes. ‘Ladilala’ by Nekes opens the release, the Oslo boss implants his signature hooky, driving motion on the cut with punchy, linear drums and sporadic ride splashes adding a jazzy shuffle. A bulbous sub-bassline is introduced to the focal point of the cut alongside a moody pad line that smoothly evolves throughout the track, resulting in a heady peak time cut. Next up is Area Remote artist Alex Piccini, teaming up with Mr. Bert for ‘Abbey’, a percussive, groove-led track built upon organic drums and boomy sub-bass. The cut evolves with delicate intricacies hidden in the background depths as perc one shots creep in and out and intermittent reverb bursts and delays build an expansive atmosphere. Giuliano Lomonte delivers ‘Rare Times’ next, a raw, rolling house record employing punchy 909 drums, off- kilter claps and an infectious shuffle as its driving force. Lomonte then introduces a heavily manipulated spoken word vocal to the breakdowns adding impact to the drops. Closing the release Ama offer up as a digital bonus ‘The Streets’ by Luna Records artist Bolumar. The Spaniard drops a slice of dark, underground house to wind down the EP, bright synth chords and swung drums provide the initial movement while incomprehensible vocal murmurs and additional synth shots are introduced to the latter stages adding to the musicality of the cut. It’s out today.